Great location. Rosa was wonderful about getting us a metro map and giving us topics about the area. Nice bed and sofa. Dog could stay with us. Very good location. Loved that the place was dog friendly. The woman at reception even kept a stock of dog treats. The building is about a 13-minute walk from the bus station. It is easy to walk to all of the tourist sights in the historical center. Staff are very friendly. Location is fantastic. All the restaurants and bars are just a few minute walk away. Major attractions are also in arms distance. The rooms are clean and tidy. The personnel is very helpful. You also have a small kitchenette in the room so you can cook for yourself if tired of eating out. The receptionist was very nice. The view from the balcony. Really excellent value for money. Warm, spacious, friendly reception, doggy friendly, on site parking in the centre of the city - really good choice, would definitely use again. Lock in a great price for JCH Congreso Apartamentos – rated 8.7 by recent guests! One of our top picks in Salamanca.These smart, modern, fully furnished apartments are located on a quiet street in Salamanca’s city center. 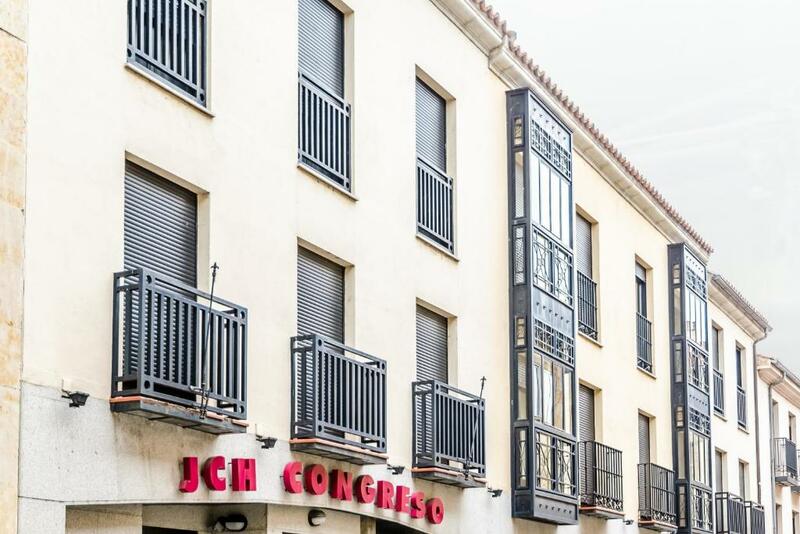 The JCH Congreso Apartamentos are located between Plaza Mayor, the university, the Casa de las Conchas and the modern area of the city. It is also convenient for the Salmanca’s bus and train station. With their setting and fashionable interiors, these apartments are an ideal choice for families or groups of friends visiting this world-renowned university city. A pillow menu is available from reception at an extra cost. When would you like to stay at JCH Congreso Apartamentos? This modern studio apartment has an open-plan bedroom, lounge and kitchen. It features free Wi-Fi and a TV. The kitchenette includes a hob, microwave and coffee maker and there is also a private bathroom. This apartment has 1 bedroom and a lounge with double sofa bed. It comes with free Wi-Fi and a TV. The kitchen includes a hob, microwave and coffee maker and there is also a private bathroom. This modern apartment features 2 twin bedrooms, a living-dining area with 2 sofa beds, free Wi-Fi and a flat-screen TV. The kitchen includes a ceramic hob, microwave and kitchenware. This modern apartment features a twin bedroom, a lounge-diner and a seating area with 2 sofa beds, free Wi-Fi and a flat-screen TV. The kitchen includes a ceramic hob, microwave and kitchenware. This modern, 1-bedroom apartment features a seating area with sofa, free Wi-Fi and TV. It has a sloping ceiling. The apartment is equipped with a fridge but does not include a kitchen. Please note that the apartment is located on the 3rd floor of the building, and the elevator only goes up to the 2nd floor. It is necessary to climb a flight of stairs after the 2nd floor. 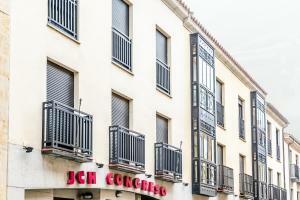 El mejor edificio de nueva construcción en Salamanca destinado a “Apartamentos Turísticos”, incluso por su situación en el centro de Salamanca, muy próximo a la Plaza Mayor y por tanto al centro financiero de la ciudad. Muy cerca de los hospitales, junto a la zona antigua y Palacio de Congresos, y a diez minutos de la estación de autobuses. PARKING PROPIO. Dispone de estudios y apartamentos de uno y dos dormitorios, equipados con todo lo necesario para poder desarrollar una vida normal, y siempre con el equipamiento renovado y puesto al día. Entre su equipamiento cuenta con sábanas, mantas, colchas, toallas, secadores, TV plana, aire acondicionado, WI-FI gratuito. Cocinas (microondas, frigorífico, placa vitrocerámica de dos fuegos) completamente equipadas. Tenemos un especial cuidado con la limpieza y mantenimiento, escuchando las demandas de nuestros clientes a través de nuestra recepción. House Rules JCH Congreso Apartamentos takes special requests – add in the next step! One child under 2 years is charged EUR 7 per night in a crib. JCH Congreso Apartamentos accepts these cards and reserves the right to temporarily hold an amount prior to arrival. Apartment guests must sign a contract upon arrival detailing any additional costs that may be incurred during the stay. This will be checked before departure. Reception opening hours is from 10:00 to 20:00. On Fridays, reception is open until 22:00. Please note that check-in takes place between these hours. Please note that elevator only reaches the second floor. Please note that some apartments are located in the attic. Please inform JCH Congreso Apartamentos of your expected arrival time in advance. You can use the Special Requests box when booking, or contact the property directly using the contact details in your confirmation. Reception closed 8pm - 10am. I left money on checking out early which they now claim they didn't receive and charged my credit card again. Refused a refund. It can be a bit noisy when windows are open. Many students are passing by and sometimes are quite loud. One evening I wished there was a small bar on premises. Found it strange that there were no plugs for the kitchen sink, bathroom sink or bath. I hate wasting water. Just the position of the basin, you can't sit in the toilet at all!!! The garage for parking car is the most difficult thing I have ever encountered in over 50 years of driving. Anything larger than a smart car will find it impossible to access the underground parking without forward and reverse manouvering at every turn. I would definitely not use the hotel again with my car which is sad as the facilities otherwise are superb, however I will not use this accomodation again with such parking difficulties! Cristina at the hotel reception was warm and friendly and spoke very good English. The facilities in the room meant that we could prepare some basic meals with food we already had on board in our car, as well as teas and coffees in the morning and evening in the comfort of the room - hence a huge saving on food and drinks. A perfect stopover between Portugal and the ferry port in northern Spain, especially with the beautiful city of Salamanca on the doorstep of the hotel apartments. No plug for the bath. Quiet and comfortable. Perfect location. On site parking. it sometime accommodates students as well and sometimes very noise students just stayed your next door. Located in the central area with interesting sites around. It is clean and well maintained. The rooms are okay but very basic and drab, Fittings a bit tired in places but clean. No kettle! Location right close to historic centre, Underground parking [god access but care needed with a largeish vehicle] Friendly welcome. Night security guard on premises. Great location and very nice and helpful staff!